There are very limited opportunities to get trained as an audio describer. Training is often held in conjunction with conferences. Here we list the opportunities that we know about, and we solicit information from anyone who is offering training opportunities for audio describers anywhere in the world! Our "flagship" training program is the Audio Description Institute, but the following programs are listed in the order of next-scheduled training. Jan Vulgaropulos and Colleen Connor offer Audio Description Training Retreats in North Carolina. Their all-inclusive price for retreats covers 4 nights lodging in a waterfront home on Lake James, meals, and 20 hours of formal classes plus materials. A discount is available for students willing to share a room. Retreats are limited to 8 participants to ensure ample practice time and feedback. The next training retreat will be March 14-18, 2019, on Lake James, Nebo, NC (fly in to Charlotte where you will be picked up). However it is SOLD OUT, so they have scheduled an additional training session for May 16-20, 2019. Read the retreat brochure. The two instructors are Jan, an audio describer, and Colleen, a consumer of audio description. Colleen’s guide dog, Joplin, will also attend. Transportation to and from the Charlotte, NC (CLT) airport is included, with arrival Thursday afternoon and departure Monday morning. There are 20 hours of formal classes on Friday, Saturday, and Sunday, including generous practice time during classes, with informal learning and networking after hours. Hiking, kayaking, swimming and a boat tour of the lake are offered each afternoon. Read a full description of the Retreat. Note: The Training Retreat is not sponsored by the ACB or the Audio Description Project. ADI is held annually at the ACB's Annual Conference in JULY each year, plus several other times throughout the year. 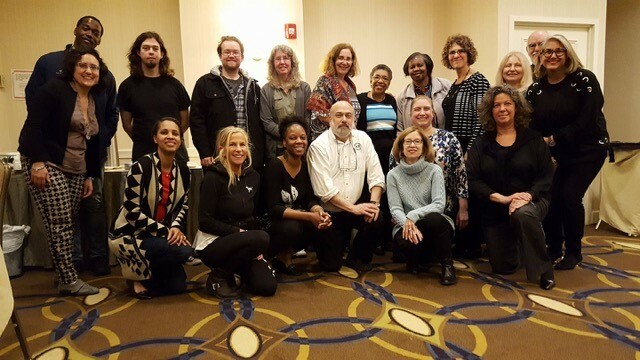 The last class was February 23-25, 2019, in Alexandria, Virginia, in conjunction with the ACB Presidents Meeting. The next class will be in Rochester, NY, July 10-12, 2019. We will post details and sign-up information here and on our main page nearer to that date. NOTE! The ADI is taught by the director of the Audio Description Project, Dr Joel Snyder, who has taught audio description all over the world and obtained his doctorate degree in the subject. In July 2014 he published a book based on his work with audio description: The Visual Made Verbal, available for under $20 by clicking the link. The book is given to each workshop participant. This training is held annually at the LEAD Conference, which is generally held in August. The mission of the conference is "to explore practical methods for implementing accessibility in cultural environments [and] share resources and knowledge, develop best practices, and experience accessibility in action." The next conference will be August 3-7, 2019 in Denver, CO. The first two days of the Conference are called Capacity Building Workshops, and a typical class would be entitled An Introduction to Developing Audio Description Skills. This full day interactive workshop will introduce the foundation of audio description, the “3 Core Skills” and its application to live performance and exhibit/museum disciplines. Attendees will experience the practical application of the core skills through participatory exercises, lectures, and demonstrations in a shared setting. This workshop is recommended for those both new to audio description, as well as those looking to refresh and expand their basic skills. A second workshop is often held on a different AD topic. FOR MORE INFORMATION, see the 2019 LEAD Conference. Note: the LEAD Conference and its Audio Description training is not sponsored by the ACB or the Audio Description Project. How to articulate visual details effectively and in the moment. How to enhance the theater and gallery experience through audio description for an audience of those who are blind or have low vision. Tips for bringing audio description to your own organization. The last class was January 10-11, 2019, at the NC Museum of Art. The next one is likely to be in early 2020. For more information: email Betsy Ludwig; or call Arts Access at 919-833-9919. Note: This training program is not sponsored by the ACB or the Audio Description Project. Access Virginia in Newport News also provides training for audio describers. They will publish information here the next time it is offered. In the meantime, you can contact them at accessvirginia@gmail.com. Here we list pointers to information about audio description in education, both for training and for acquisition of the end product. DCMP refers to the Described and Captioned Media Program. We are pleased to make available a copy of Gregory Frazier's May 1975 Master's thesis on audio description, The Autobiography of Miss Jane Pittman: An All-Audio Adaptation of the Teleplay for the Blind and Visually Handicapped. "Frazier realized that the concise descriptions he provided for his friend extemporaneously could be thought-through, edited, recorded and played through FM radio receivers at movies - or carried over secondary audio channels on television. Frazier, a graduate of San Francisco State University, returned to college to obtain a Master's degree in broadcast journalism, developing a thesis-'television for the blind'- that explored the use of description to enhance the 1974 television production of The Autobiography of Miss Jane Pittman. "In 1991, Mr. Frazier founded the non-profit corporation AudioVision SF to provide description for the performing arts in San Francisco-area venues. AudioVision SF still exists, providing description on a regular basis for theater performances throughout the Bay Area. 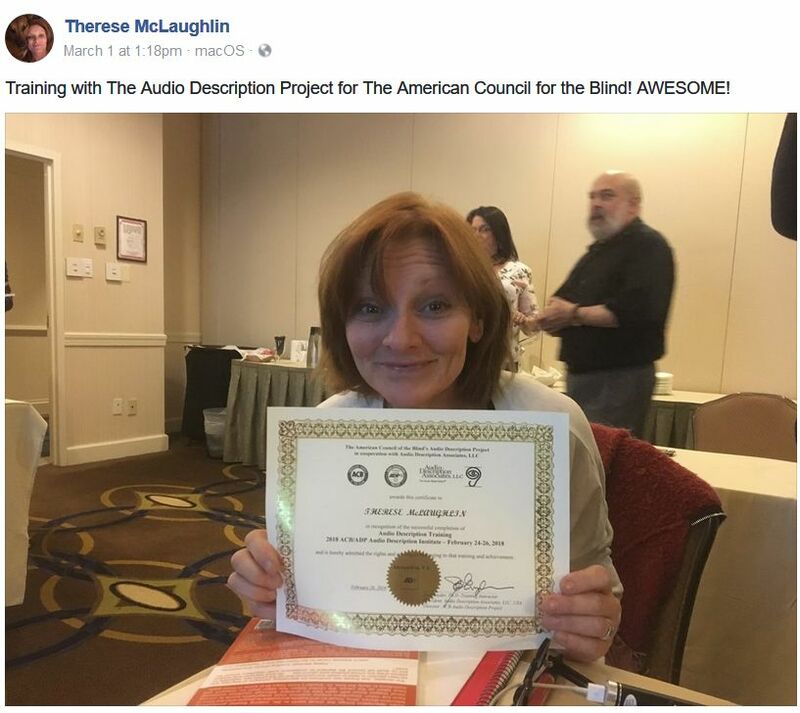 In 2010, Audio Vision SF and Gregory Frazier posthumously received the Barry Levine Memorial Lifetime Achievement Award in Audio Description, presented by the American Council of the Blind's Audio Description Project." The Visuals Into Words Project was created on the premise that "A deeper understanding of how images are transferred into words is still needed." Accordingly, they created a free 15 minute film (translated to several languages) that anyone can use to study "how audio description is approached by different describers in diverging cultural environments and also how end users receive the audio described content." If you have any contributions for this page, please send them to the webmaster via the link below.